Welcome to Literary Mary Chats, the August edition. 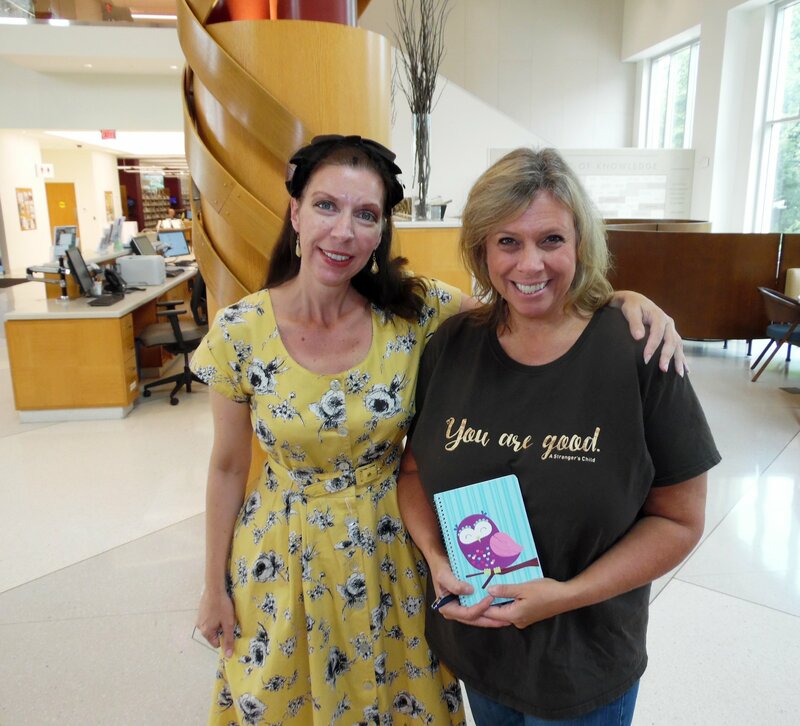 I met this month’s guest at the DeKalb Public Library Author Fair. I’m embarrassed to admit it (as a writer) but I did not have a notebook to help pass the time. Thankfully, and fortuitously, this lovely woman in vintage garb kindly passed me a gift bag. In that bag, you guessed it–a notebook! That’s how Bambi Harris became my new favorite person. Bambi Harris is an Australian-American author of numerous novels, most notably the popular, Afterlife Series, an Afterlife-based series that follows Penny Lane’s chaotic day to day life beyond her death. A prolific novelist and instinctive luminary, her books are touted for their unique voice and engaging story lines. 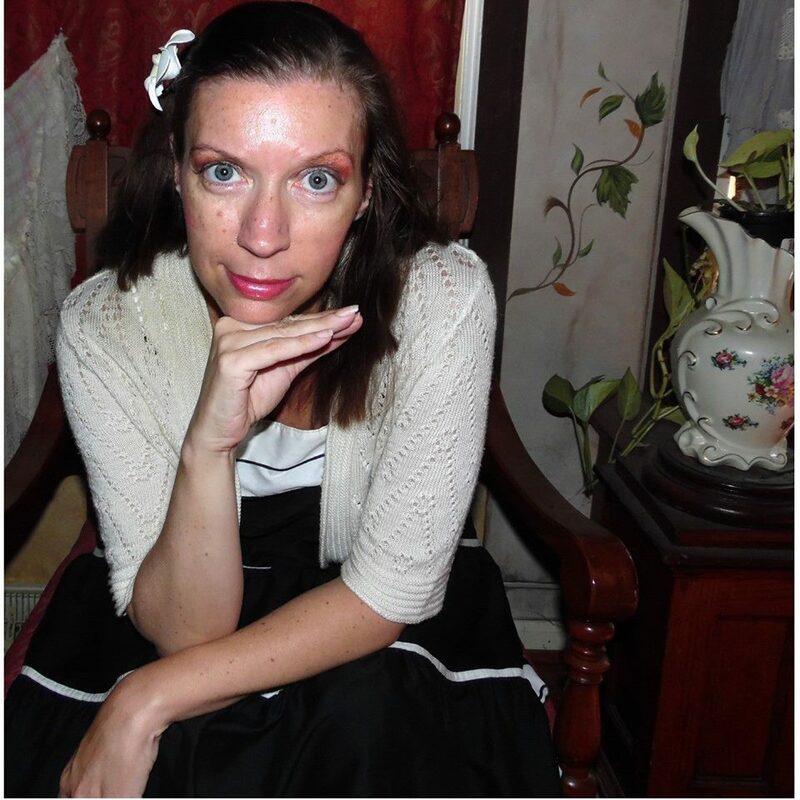 Catering to both adult and young adult in content, her themes include death, romance, murder, time travel, history, the supernatural, and most of all, mystery. ​She lives with her husband and dogs in rural USA in a historical museum themed house. She enjoys antiques, history, vintage clothing and charitable pursuits. ​Other than that she is a complete mystery. I had to ask about her name; I’d never met a Bambi before. My name is one mother gave to me. First is Bambi, my middle name is Jane, it’s my real name. My mother was young when she had me and thought it was a cute name. It is just as uncommon in the states as it is in Australia, thankfully! My dad named my sister Cheryl, so I dodged that bullet and got the unique name! I love that you are from Australia and now live in Sandwich, Illinois. That’s quite a relocation! 1. How does your upbringing influence your writing and how has your style changed as you’ve become more “Americanized”? My upbringing influences my main characters, in the sense they all have a family situation where they are either not close to their family or their close family member passed on. They are often solitary people like myself so that is where that plays into it. I did not start dabbling in writing until 2007 at which point I had been in USA for 4 years so had grasped the lingo (although I don’t generally sound like it!). So my writing began Americanized and then some later series like The Coma Mysteries and The Tintype Cadavers (Memento Mortis Series) have English settings so I had to revert to some old language usages as Australian has many similarities in expression. I also have a unique writing voice in some ways that is not necessarily culturally based at all but rather derived from the eclectic individualistic person I am by nature. You write in four series?! Wow. With six stand alone novels?! Crazy! And you’ve only been writing since 2007?! That’s an amazing achievement. 2. How do you accomplish so much in such a short amount of time? What’s your secret!?! I was first published late 2009 and thank you! Yes I have 3 fiction series (one based in the day to day existence of the afterlife, one about a post mortem photographer in the 1800s who solves mysteries and one about a group of coma patients who visit the past to investigate unsolved mysteries) 6 individual historical mysteries and 8 in a series of inspirational quotes (32 in all- 33rd on the way). Unlike many successful writers I am not a reader and do no have a past filled with writing experience. I did not really experiment with it too much in my childhood. It was just before I was thirty that I decided to write a book and so I did. After that I realized I was pretty good at it and started writing more, haha. My secret to writing? I treat it like part of my day, like brushing my teeth. I try to write 1000 words a day, so I finish a book usually in 3-4 months. I also work a real person job but my secret to having the time is, I don’t have a social life or small children to occupy my non-work time so it is a little easier to find the time. You present a very striking persona. I notice you have an Etsy page, The Porcelain Bones, featuring antique garments and historical treasures. 3. Do your stories and your store intertwine? Are there objects you have bought/worn/sold that have directly impacted a novel? Unfortunately Etsy does not bring much in but I do sell vintage and antique garments on Ebay and have done for many years. I actually pay the bills by working at a YMCA. I’m a front desk girl and love the community I work in and have many of them support me with my writing and events. My stories do not intertwine with anything I sell. In general I do not bring in external factors to my writing (like real people that I know or events during my day). I generally focus on what I’m doing at the time and, when I’m not writing, I’m not thinking about it. I like to keep a slight element of fantastical in my books and as a writer I want to enjoy the escapism as much as the reader. 4. In your bio, you describe yourself as an “instinctive luminary”, please explain. How do you think this applies to your writing? This is a reference to my inspirational books. I call them ‘quotes’ loosely. Some are quotes from my books, mostly they are poignant musings that I share on Facebook that people share out into the world. I have been doing them for years and people enjoy them and I like to provoke thought while keeping things optimistic, and so these were worth publishing. But not poetry, just quotes. As for me as a person, I would think I inspire others by being myself, living my life as I want to and not being hindered by the expectation or conventions of others. In this way, I like to think other people can feel free and more confident in discovering who they are more than who they are expected to be. 5. What’s up next for you? Where is your current focus and what are some long term goals? I am writing a novel called, The Antiquarian, a stand alone book. I am focusing on attending more author fairs and putting myself and my books out there more. I want to get them into more hands and have more people seeking the next book I write. My long term goal for my books is to have more people fall in love with them, buy them, share them, review them and be happier after reading them. My long term goal for me is more time with my dogs while wearing pajamas and drinking coffee. Thank you, Bambi, for your insightful answers. I love the reaction you hope to create in your readers. I wish you continued good luck and hope our paths, literally, cross again! Bambi, the notebook, and a grateful me. This entry was posted in Literary Mary Chats, Writing and tagged Bambi Harris, DeKalb Public Library Author Fair, instinctive luminary, Literary Mary Chats, Mary Lamphere, The Afterlife Series featuring Penny Lane, The Coma Mysteries, The Porcelain Bones, Tintype Cadavers (Memento Mortis Series). Bookmark the permalink.